"The Myriopticon, A Historical Panorama of the Rebellion (1866"
One year after the battles ended, American children could watch the Civil War in the comfort of their homes. Milton Bradley, a lithographer turned game inventor, began to market a small-scale panorama that retold the story of the Confederate rebellion and its defeat. With this pre-cinematic device, families could scroll through 22 scenes lit with a candle, while reading aloud a narrative. 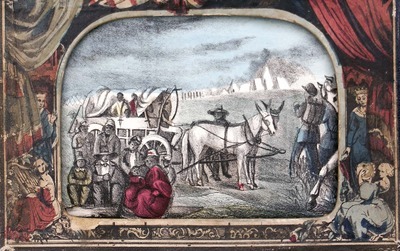 This pretend theater even had tickets and a broadside, which, along with the narrative, are lacking in the LMU copy. Intended to both edify and entertain, some images were violent and heroic, like the Battle of Fredricksburg, displayed here; other scenes were more light-hearted and comical. But with its bloody tales of the Union path to victory, and emphasis on the military components of war, the Myriopticon particularly appealed to the curiosity of middle-class boys. As historian James Marten has described, such amusements contributed to the “war culture” that shaped children’s perceptions and memory of the conflict.